THE THIRD SATURDAY IN OCTOBER!!!! 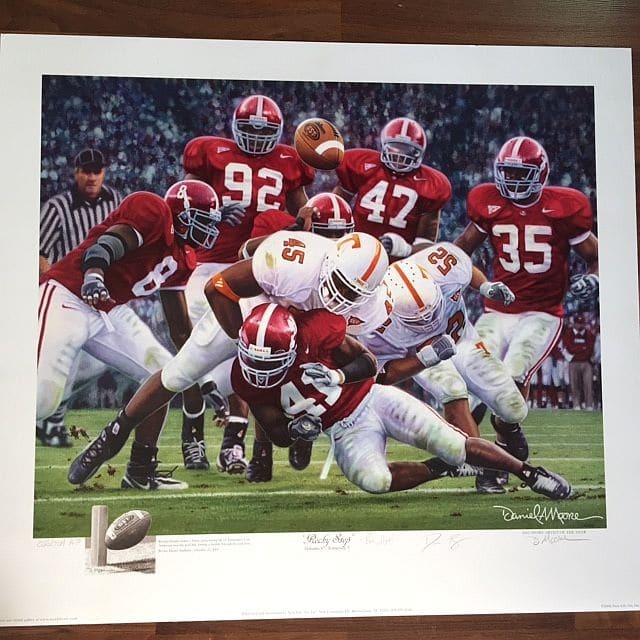 This print by sports artist of the year, Daniel Moore shows the game saving hit that Roman Harper put on Corey Anderson of Tennessee to cause a fumble out of the endzone and save a touchdown and the game. This print is a limited edition personally signed and numbered by the artist Daniel Moore and measures 24 3/4 x 27 3/4. 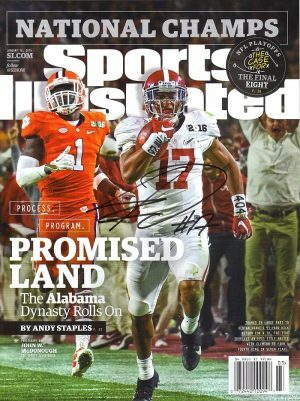 as well as the artist signature by Daniel Moore and signatures of Roman Harper and DeMeco Ryans. Roman Harper causes the game-saving fumble. Includes Certificate of Authenticity by Daniel Moore and two embossed gold seals and is numbered out of only 704 prints. Also includes an BW 8 x 10 sketch of the print and a BW 6 x 6 1/2 sketch of the ball bouncing out of the endzone.